Hello dear readers, I promised I would get back to blogging more regularly and here I am! I’m excited to be the guest blogger for Stencil Girl stencils this week and I want you to check it out at stencilgirl talk. They gave me 4 stencils of my choice from their vast collection and asked me to cut loose and produce. The post walks you through all the steps of making my latest expressive paintings – not a surprise I revisited a theme that keeps popping up in my work – BREATHE. When I’m working on these expressive paintings I like to have a whole bunch of canvases and wood panels to work on at one time. I think that frees me up to experiment more with pattern and color combinations so no one piece gets too precious. I really can “mess it up” because if I do I just add another layer and push the composition to a place I like, if it doesn’t work – no worries I have 10 other canvases that I am experimenting on. This time I used my stencil girl stencils for pattern then cut my own stencils for the figure and the lotus to create my focal point. I have made that stencil in 3 sizes so I can experiment with scale and repetition. I am happy with what I came up with. I just posted all these paintings on my Etsy Shop. I have painting in these series and others for small 6×8” pieces for $20 up to 18×24” pieces for $275 and everything in between. I hope you’ll check out my shop and see detail photos of this entire series and my guest blogger post on Stencil Girl Talk to see all the steps in making the work. I’ve been a bit wrung out these days, my to-do list just won’t get shorter, my sleep is off, the short days and early dark – you know what I mean – I’m out of whack, I’m in disequilibrium. So where the mind goes so goes the body and a few weeks ago I bent to zip my zipper or tie my shoe or something else innocuous – there was a loud pop in my neck and my range of motion stopped at about twenty-five degrees each way. Ok fine universe, I’ll do some stretching, etc and keep on going. Well let me tell you the universe did not abide, so last week after a regular teeth cleaning (nothing unusual) my jaw slipped out of gear just like the clutch going out in your car but this came with gnawing pain with every chew and my bite out of alignment….. OK, OK universe I get it – STOP – I added “take care of self” to my to-do list. There was a masseuse right here at the Ranch for the week – nothing was stopping me. So today (just hours ago in fact) I got an amazing massage! I scheduled a 90-minute massage instead of just 60 minutes (a splurge I have never allowed myself), I told my masseuse of my woes and she got to work, she dug and pressed and smoothed every inch of me with her hot angel hands. While I was on the table an image of a strong, fierce, determined angel wringing out laundry along the Ganges came to mind. The masseuse was the angel, of course, and I the laundry, the pouring rain outside played the part of the mighty holy Ganges River. After almost 2 hours she left me – set out to dry in the tree branches along the riverbank. Neck is moving to 35 degrees each way now (not perfect – but better), jaw thinking about getting back to work (maybe a few more days). Thank you universe for reminding me to take care of myself – but next time can you just send me a text? So here is your reminder before it’s too late- make time for yourself in the midst of your all your busy! PS – Thanks Angel Anya for your strong hands and open heart! This week I have been in deep seeking mode. The early rains, the cold mornings tell me it’s time – golden chanterelle time that is. So each morning this week I have put on my rubber boots and grabbed my mushroom kit (a knife to cut the mushroom off below the dirt, a natural bristle brush to whisk off the dirt and a bag) and set off. These scrumptious beauties like to rise up in the deep leafy duff below the oak trees, blackberry bramble and poison oak spouts so this effort is not for the weak I tell you. These past drought years there haven’t been any chanterelles (at least that I could find) but this year I was heartened to see lots of fungi sprouting so shouldn’t the chanterelles arrive too. But each brisk morning I have been disappointed, bright orange, brown, black and white caps of other mushrooms have revealed themselves but not my tasty treasure. So this morning, like the others, I donned my boots and grabbed my bag – keeping my eyes low scanning the ground under the trees. As I walked up the back driveway, here at the Ranch, the open pasture to the north sparkled in the early morning light and the bright sun filled the grassy bowl. My head lifted and I forgot my mission, the sun so inviting, I was enticed to climb the hill to the open ridge. When I reached the top my heart pumping, my thighs burning and my lungs filled with the cold, crisp December air I turned to the sun in the east and stretched out my arms I stood a long while in that warm embrace, then turned back towards home, chanterelle forgotten but satisfied just the same. Like my search for the mushrooms when I started this painting I was seeking one thing then found another. This image of a man releasing a bird came to me soon after my dad died and it seemed to encapsulate some of my feelings of his death days, so I did some sketches and then asked my son to pose for me so I could create the silhouette from my minds eye. This painting did not come easy, not spiritually per say, but technically I had all kinds of mishaps with paints and spills and goopy varnish that would dry that had to be carefully scrap and sanded off, I wrestled and cajoled and tended this painting to it’s finish. As I worked the painting the meaning shifted, and what I thought was about setting my Dad free, it became more about my relationship with my son and setting that free, trying to find new ground in the parent to adult child relationship. So this was a long winding way to say – keep seeking just be ready to find something you’re not looking for! PS if you kept reading this far well good for you – here is A GIFT FOR YOU! It’s a link to one of my recent paintings you can print out to have even if you can’t come to my studio! In my last post I shared with you some of the pieces I did inspired by the phrase “peace be with you”. As the week went on that became something of a mantra. 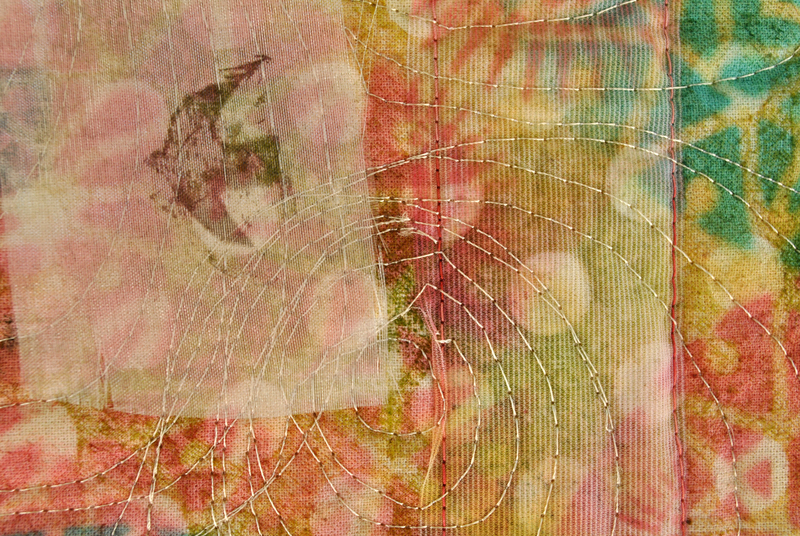 I kept cutting and stitching and reflecting the idea in different ways, until a series emerged. Some time while I was working the Sheryl Crow song, “Peace Be Upon Us” kept tunneling through my brain not so much an ear worm as is sometimes the case when songs won’t leave you alone, no this song wove itself into my Peace series lifting and lilting like a hawk on an up draft. I found myself humming at my sewing machine making my efforts into something of a meditation on peace as well as a creative endeavor. I want you to get a sense of my mental space so click this link to get this lovely addiction wandering in your brain too! PEACE BE UPON US ALL – Sheryl Crow listen to the whole song I think you might me humming this through your week – and if your going to have a song stuck in your head well, I think one about peace is a good way to go. detail of quilt- The concentric circle stitch was inspired by watching the baby ducklings swim in the pond here at The Bishop’s Ranch! 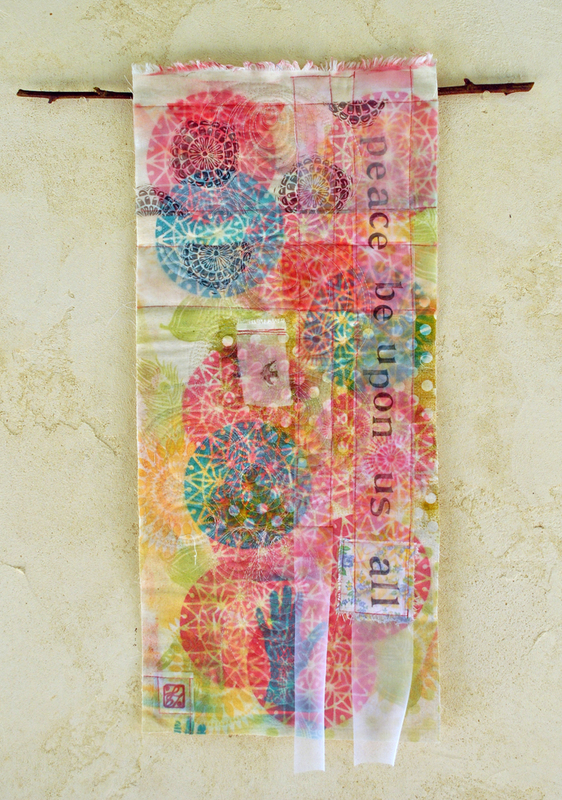 I’ve got a few more pieces to show you from this series- I want to spread the peace around a little bit!